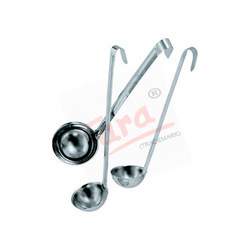 This buffet ladles are available in sizes of 12",14",16" in lenngth with bent handle at the end so that the ladle doese not sink in the chafing dish. Packaging Details: single pcs in a pp 12 pcs in a box 30 kgs in a carton depending upon the size and weight of the ladle. Looking for Serving Utensils ?